This is my new neighborhood. 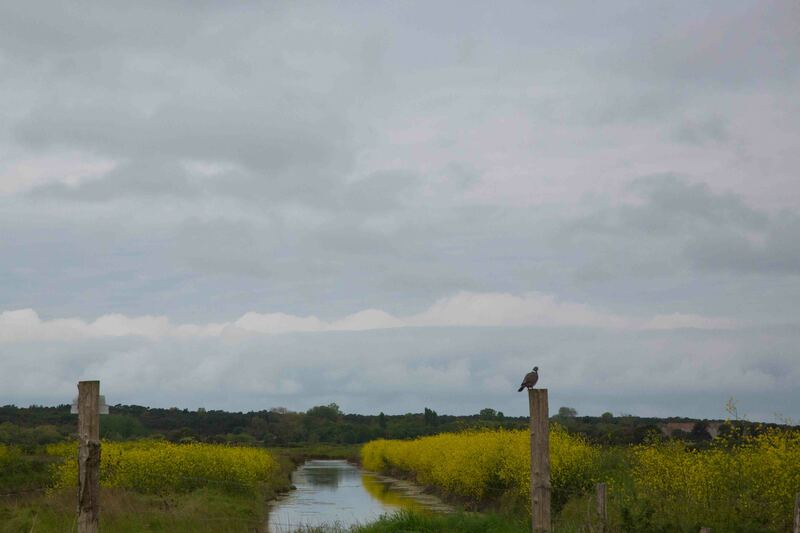 This corner of the Marais Poitevin is closer to the coast than am I, so it is flatter and wetter than around my house. Still, it gives you the idea. That sky is the same in both places and it will clear your head out in 90 seconds flat. So, lesson time. The Marais Poitevin is a marsh. Over time folks have created canals and these ditches, which allow the adjacent ground to drain. Some of the land is used for farming or salt making or preserved as wildlife area. Some of it is developed; you would never know you are in an area designated as a park. All of it is windy, so we are looking at adding a wind turbine or two to the house. Wind turbine – wonderful source of green energy. Do they have LEEDS certification in France – is this part of the renovation plans? Gerard, I think LEED certification is based in the US, but any building can become LEED certified. At least right now we are not going for that but we are looking into the various ways we can get government subsidies, reduce VAT, whatever we can do to reduce construction costs. I chose my architect, Nicholas Adams, largely because of his expertise in this area. Also, just as a practical matter, this is a roughly 4800 square foot house. That makes it about double the size of my California house, even though it will cost half as much, even finished. Anyway, I’m going to do everything I can to reduce its operating costs. We’ll add insulation, of course. Even drywall has insulating value. We are doing the previously mentioned geothermal energy thing to heat the place. This will include heated flooring on the ground floor and radiators on the upper floors, hot water and, when the gods smile and I get my pool, heating for that. We’ll have thermopane windows that will retain the profile of the 19th century windows; my lead finish carpenter specializes in that kind of thing. Every design decision is being made with lifetime energy costs in mind. So, in terms of it retaining the feel of a 19th century house, one of the ways we are probably not even going to try has to do with lighting. We will use LED lighting wherever possible; actually Nick says there is something even better out there, so we’ll use that. I much prefer task lighting to general lighting, so I am hoping that it won’t be too obvious that we’re not even trying for historic accuracy on that. Another blasphemous but eco-friendly act we intend to commit is to rip out the original — ugly — fireplaces. The walls are thick enough that they will be flat, with no sign that a fireplace was ever there. The chimneys will be sealed and used as utility chases. Most paint over here is water-based. The roof is already slate and flooring on the upper floors already wood. One of the great things about starting with an old house is that it lends itself to natural materials, which has to help reduce the carbon footprint. Thanks for mentioning LEED certification. I will go through the guidelines to make sure we are covering all bases. If I decide to go for the certification, I’ll do at least one entry about it. Okay, Gerard, here is my one entry. I found the LEED Certification Checklist for Homes. It is 161 pages long. You need a LEED rater. They strongly recommend that you get a LEED builder. There are references to FEMA and various other US government agencies — in other words, plenty that can’t apply in France. So the LEED certification is out; I wasn’t paid enough to deal with this kind of bureaucracy back when it was my job and now that it’s not my job, no way. However the checklist is interesting, in no small part because I can see that many of the things we are incorporating, such as a graywater system, are part of the LEED requirements. I’ll go through it to see whether we can pick up a few ideas. Thanks again for bringing it up. Sue, thanks. I just found out that this October my photography buddy Herb is making his wife take five days out of their stay in Paris, so that they can visit the Vendee. I have to get my photography chops back to where they should be; Herb is formidably talented and, even more intimidating, he has technical skills to match. I sure hope the weather cooperates.